On the OpenCV 2.3.1(WITH_QT), if you zoom in than certain value, the pixel value is always displayed. 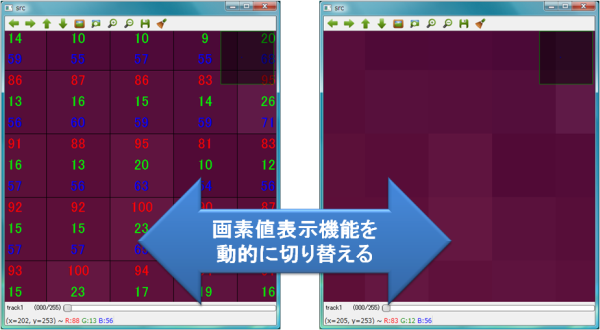 This page describes the method to switch enable/disable drawing pixel value on OpenCV 2.3.1. Please download opencv_qt_window_extension_v1.zip. And, extract this file. Please enable "WITH_QT" on CMake, and build OpenCV. as arguments of cv::setWindowProperty? and cv::getWindowProperty?. PukiWiki 1.5.1 © 2001-2016 PukiWiki Development Team. Powered by PHP 7.1.26. HTML convert time: 0.262 sec.